Music lovers take notice! It doesn’t get much more perfect than this. 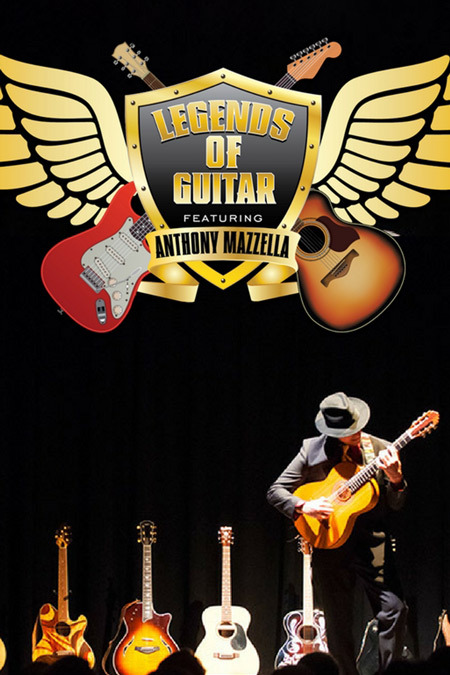 Anthony Mazzella’s “Legends of Guitar” show is a dazzling spectacle featuring one of the most highly-skilled musical artists in the country channeling the raw power of living and deceased guitar legends with multiple instruments on stage. Mazzella’s skill easily matches the legends he pays tribute to: Carlos Santana, U2’s “The Edge” and David Gilmour of Pink Floyd, to name a few. Like all the greats, he has labored since childhood to master his craft. The guitarist’s storytelling is equally engaging. His original inspiration came as a young boy when Mazzella’s ear tuned out the vocalists altogether. “I only listened to the guitar parts on my records. I often had no idea what the singer was singing about. Guitarists are the mad-scientist composers of the band, the rest of the band falls in behind them,” said Mazzella. From The Who’s Pete Townsend to Led Zeppelin’s Jimmy Page, Mazzella saw his destiny in rock idols. His show includes a taste of Iron Maiden — flamenco style, that is — and jaw-dropping renditions of Jimi Hendrix’s “All Along the Watchtower” and “Little Wing”, as well as classic tunes from Stevie Ray Vaughn, The Beatles and Chris Isaak. Mazzella’s “Legends of Guitar” show is more cutting-edge than imitation, a powerhouse creative spectacle that is equivalent to seeing all the guitar greats in one room at their peak. He can seamlessly weave a rich tapestry of hard-driving rhythms paired with delicate and soaring guitar leads in a passion-filled blend of musical bliss. Mazzella has also performed internationally at events for Wynn Las Vegas, Bellagio, The Mirage, Montage, Nike, Puma to name a few. He has opened for headlining artists, James Brown, Tower of Power, The Commodores, and Spyro Gyra. A notable performance was at The Vatican in Rome Italy where Mazzella lived for several years. His original music is composed with a fusion of world influences consisting of Classical, Flamenco, Jazz, Near Eastern, R&B, Celtic, Rock, New Age and Medieval. His influences are many, but none more profound than the music and techniques of guitar masters such as Michael Hedges, Pat Metheny, Carlos Montoya, Pepe Romero, William Ackerman, Eddie Van Halen, Andres Segovia and countless others. If you are a fan of guitar music do not miss this world-class virtuoso and his extraordinary “Legends of Guitar” concert! Anthony Mazzella’s “Legends of Guitar” concert will take place on Thursday, May 30 at 7:30 p.m. at the Mary D. Fisher Theatre. Tickets are $15 in advance and $20 at the door. For tickets and more information, please call 928-282-1177 or to order online, click on the BUY TICKETS link above. You may also purchase tickets at the Sedona Film Festival office and Mary D. Fisher Theatre, located at 2030 W. Hwy. 89A, in West Sedona.